Holiday Spiced Almond Shortbread Cookies are soft and buttery and melt-in-your-mouth delicious. 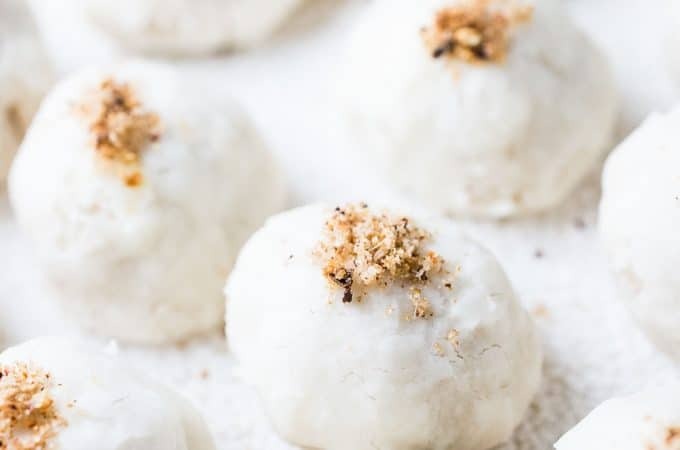 They're made with almond flour so are naturally gluten-free and can easily be made vegan – but don't make them (or not make them) because of that. This is a Christmas cookie recipe that everyone will love. Bring on all the almond shortbread cookies! Every single one of them. And then a few more. What I've learned about these buttery balls of goodness is that there is no such thing as too many. That concept simply doesn't exist. ← I've tested that theory to the max and I can assure you it's true. My neighbor (Hi, Danielle!) was the person who got me hooked on almond shortbread cookies. She brought me a version of these she made with Meyer lemon zest. They were AMAZING! Right away my mind started whirling around thinking of all the different versions I could make. It was dizzying. I knew that an almond shortbread holiday edition had to be on the menu. It was a must. When I found out about the Vitamix Winter Spice Seasoning, I knew they were meant for each other. Are you thinking that a cookie recipe and a Vitamix giveaway are an odd pair? Don't worry, you're not alone. The first thing my handsome man asked me when he saw me making this almond shortbread in our Vitamix was, “why are you making cookies in our blender?” Fair question. The answer is simple: because it's super easy. And you know me, I like good food, but I don't like to fuss over it. 1. Put the ingredients in your Vitamix. 3. Roll the cookies into balls and bake. 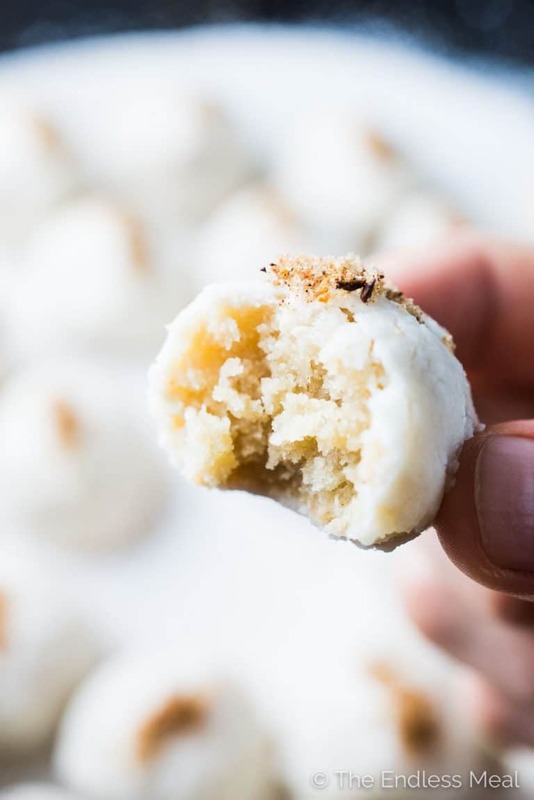 These almond shortbread cookies are insanely delicious. They are so tender and buttery and literally melt in your mouth as you eat them. They also only have a small amount of sugar in them, as far as cookies go. I'd plant these firmly in the healthy-ish Christmas cookie category. Bonus! And, since they're made with almond flour, they're naturally gluten-free. Don't let that throw you off, though. (Reading that a cookie recipe is gluten-free would normally make me run.) Unlike most gf baking, these almond shortbread cookies are AMAZING. So good that amazing deserves to be capitalized. Even my handsome man, who would normally make all sorts of faces if I offered him gluten-free cookies (and don't get me started on how fast he'd run if I said they could be made vegan. ha! ), couldn't stop raving about how good these are. 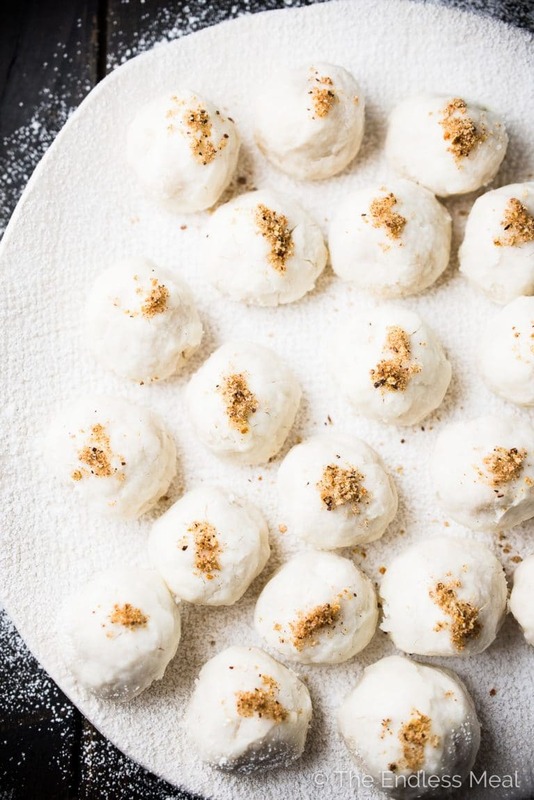 Delicious little snowball cookies right here, my friends. 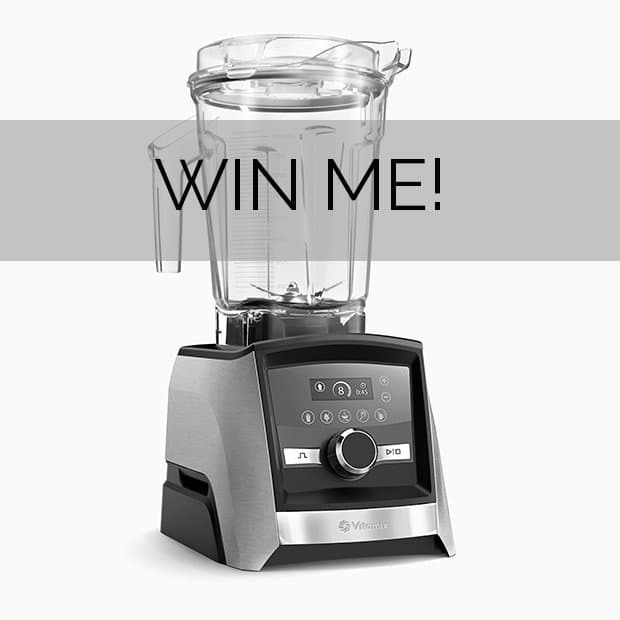 Onto the really good stuff … the VITAMIX GIVEAWAY! Here's the real deal. My Vitamix and I have the best of pals ever since I brought her home six years ago. (And yes, I did personify my Vitamix and I'm only a tad embarrassed about it.) I use it almost daily and have a ton of recipes here on TEM that call for a Vitamix. I'd be lost in my kitchen without it. Vitamix has (super generously!) offered one of their machines to one lucky TEM fan. That's you! My hope is that (1) you will know how much appreciate you being a part of this blog, (2) the soon to be new love of your life will encourage you to love spending time in your kitchen, and (3) your holidays will be that much sweeter. Holiday Spiced Almond Shortbread Cookies are soft and buttery and melt-in-your-mouth delicious. They're made with almond flour so are naturally gluten-free – but don't make them (or not make them) because of that. This is a Christmas cookie recipe that everyone will love. 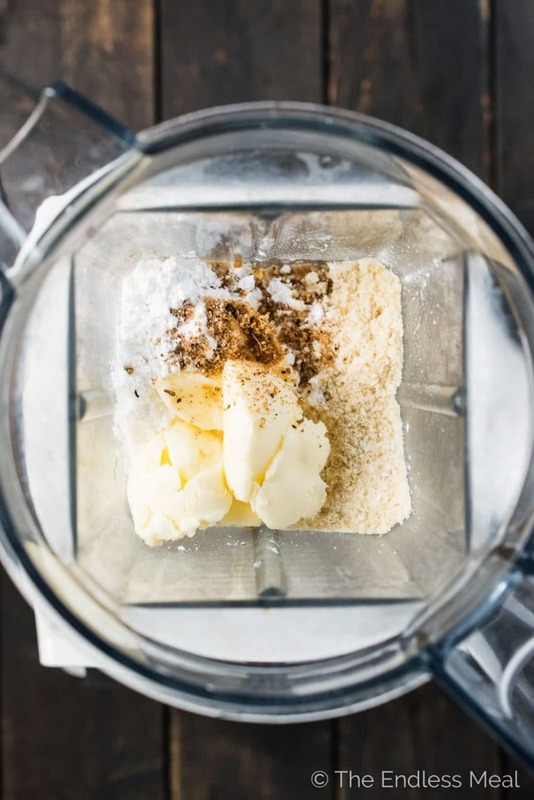 Add the almond flour, 1/4 cup powdered sugar, butter, vanilla, and Vitamix Winter Spice Mix to your Vitamix. Turn on your Vitamix and slowly increase the speed to 3 or 4 and blend the dough. Use the plunger if needed. Blend only until the dough comes together (no more than 30 seconds) then transfer the dough to a bowl. 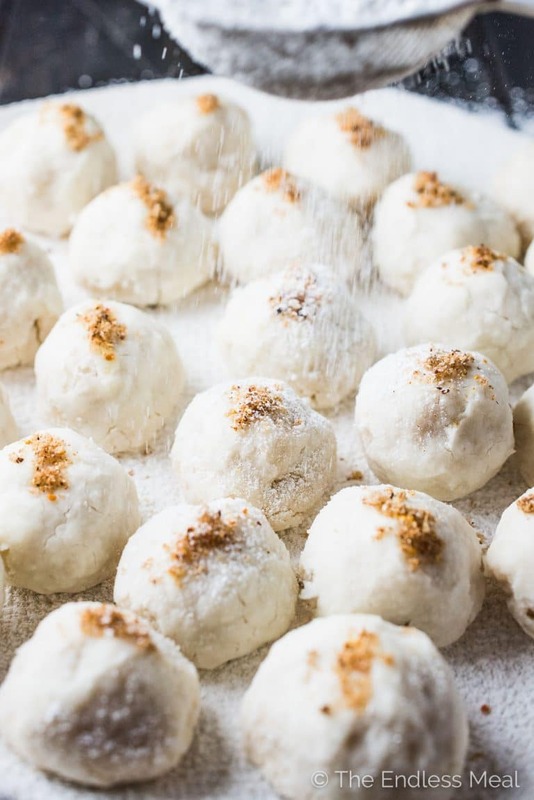 Make 12 – 1 tablespoon balls then roll them in some powdered sugar. 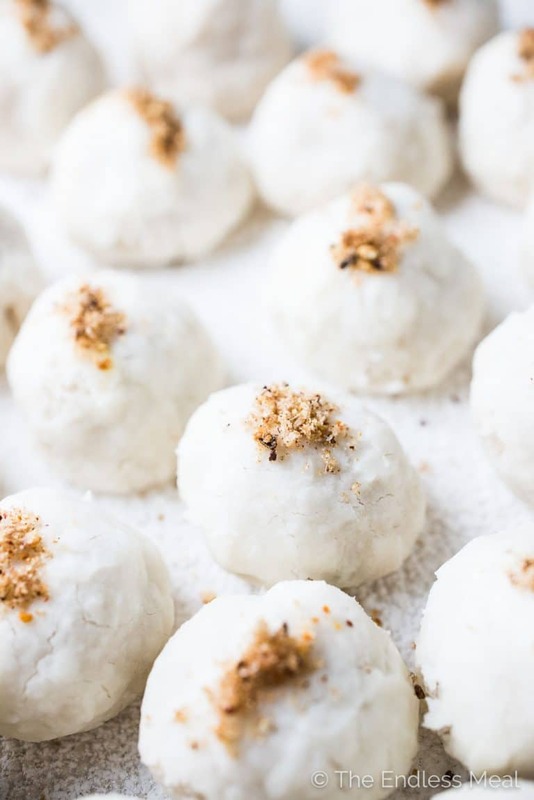 Place them on the prepared baking sheet, sprinkle the tops with a little extra Vitamix Holiday Spice Mix, then bake in your oven for 10 minutes. If you blend the dough too long the heat from the Vitamix can melt the butter. If this happens, the dough will feel oily. Divide the dough into the 12 – 1-tablespoon portions and chill in your fridge for about a half hour before rolling in the sugar. Don't worry, it won't affect the taste of the cookies. My alteration to this recipe turned out pretty well, so I’m offering a variation. I don’t have a vitamix blender or the spice mix in the recipe, and almonds often appear in recipes with cherries, so I substituted maraschino cherry juice for the vanilla extract and mixed everything together by hand. I placed a maraschino cherry in the middle of each cookie before baking and made 13 cookies. I only wish the recipe had made more. Next time I will have to double it! The spice mix is wicked salty… possible that it should have been teaspoons, not tablespoons? It is salty! There’s just a little sprinkle on top so (I think) it’s just right. Sweet and salty is such a great combo! How do you change the recipe to make the lemon version? I just made these and sprinkled a little cinnamon on top cause I didn’t want to make the spice mix. They were great! Will make them again adn experiment with different flavors. Good call on the cinnamon!! 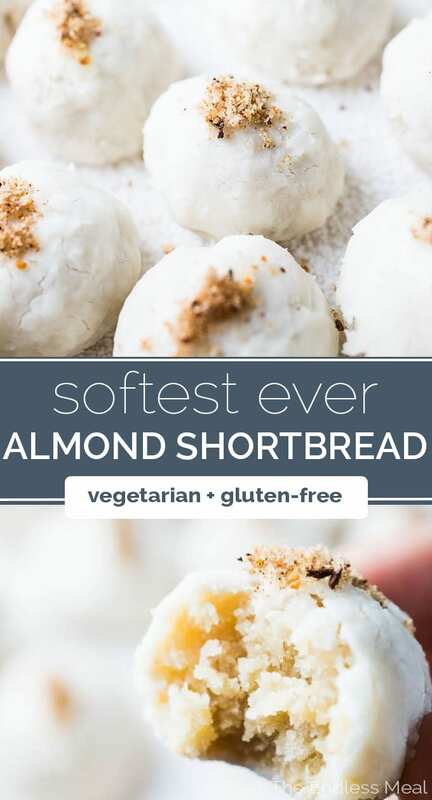 I am just starting to get into almond flour, so this recipe is on my to-do list, these cookies sound just absolutely delicious! It’s such a great healthy flour to cook with! I hope you love these as much as I do!! My favorite treat is fresh guacamole. I’ll make up a batch, sit down with it, and eat it up with a spoon!!! Guacamole is the best, isn’t it?!! Peanut butter blossoms are my favourite! I love peanut butter everything!! My favorite treat has always been Nanaimo bars. I love Nanaimo bars, too!! My faves are the homemade chocolate treats my sister concocts.Various liquors,chillies, all types of different flavours. Homemade is always the best, isn’t it?! I love shortbread cookies & nanaimo bars! My granny used to make the best minced meat tarts. I still dream of them! I LOVE soft ginger cookies! Perfect with coffee! I’m making a few batches this weekend. I’m all about cookies and coffee, too! Nanaimo bars are a must ! I recently was searching for a white chocolate cranberry shortbread cookie for a xmas bake sale and I came across your recipe! They turned out great and were a hit! I am excited to try out this recipe for more Xmas baking! Thanks! Peach cobbler, usually made with canned peaches. Talk about sunshine in a pan ? Yum! I could use a little sunshine ina pan right now!! My best friend’s daughter just turned me onto peppermint bark. How have I lived for 32 years without knowing about this?! She got some in a little goodie bag from a holiday party and I feel guilty to admit that I ate most of her treat. LOL I’m going to make some after checking out a million variations on Pinterest. Peppermint bark sounds amazing! I’m going to have to look for a recipe now! My favourite holiday treat is a spiced apple pie with cream. Apple pie is so good! Shortbread is my favourite! Christmas is an awesome excuse to make it. I love love love Nanaimo bars, too! My favourite holiday treat is homemade almond roca bark. I love store-bought almond roca so I can only imagine how good homemade must be. Yum!! I would have to say pecan pie! I love pecan pie, too! These look so good! Shortbread cookies are one of my favorite. Never too many shortbread cookies! I can’t help it I love fruit cake! I once had a really good one, too. It was homemade and totally different than storebought. Yum! Yuletide log is my favourite holiday treat. Yum! Such a great fav! So fun to eat it after isn’t it?! My favorite holiday dessert is Lefse. It is a flat potato bread from Norway. It’s not really just a holiday thing, but my family makes it every holiday season! I’ve never heard of that before, but it sounds amazing! I need to try it! These look absolutely amazing! Going to have to give them a try. Thanks! I’ve got to say that my favorite holiday treat is a family tradition – we call them paintbrush cookies! We make a sugar cookie dough from an old, beat-up edition of “Betty Crocker’s Cooky Book” and then paint them with a colored egg yolk “paint” (which bakes up a bit puffy and 100% tasteless). They are so beautiful and actually really delicious! I’ve never heard of painting with colored egg yolks before. I’m definitely trying that!! I made these last night, thought I would bring them to work, but finished them all! Hahaha I love it! Best compliment ever! I love shortbread cookies. So buttery and the texture is so nice. Myfavorite holiday dessert is nanaimo bars and I see some amazing photos of some so I’ll have to check out the recipe! Shared all over. Love this! Nanaimo bars are my #1 too! I shared my mom’s recipe a few days ago. They’re my fav!! My favorite holiday treat is very thinly sliced date nit roll slices, with lots of freshly shelled pecans. That’s such a great idea! I’m trying that for sure! My favourite is spiced nuts. Mmmm savory is always so good! These look amazing! I love shortbread but don’t eat it enough! My favourite holiday treat has to be crinkle cookies! Crinkle cookies are so good!! My favourite Christmas Treat would be anything with marzipan on it! When I was a kid, pre food processors, my grandmother taught us to make marzipan and I’ve been hooked ever since! I absolutely adore whipped shortbread!! My family has been making cookies very similar to these for generations! We call them snowballs (because they’re rolled in icing sugar) and we put red and green maraschino cherries in the center of each of them. They’re a Christmas staple in our family!